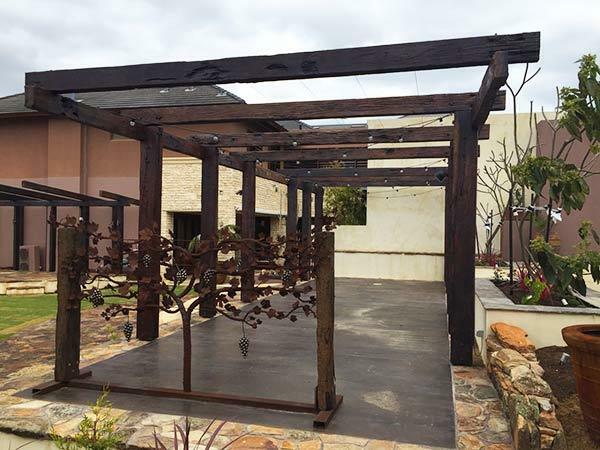 At Fremantle Timber Traders we have an exceptional collection of hardwood posts for recycled timber projects in Perth; Rustic salvaged wharf timber, big beams, natural look bush poles and more. 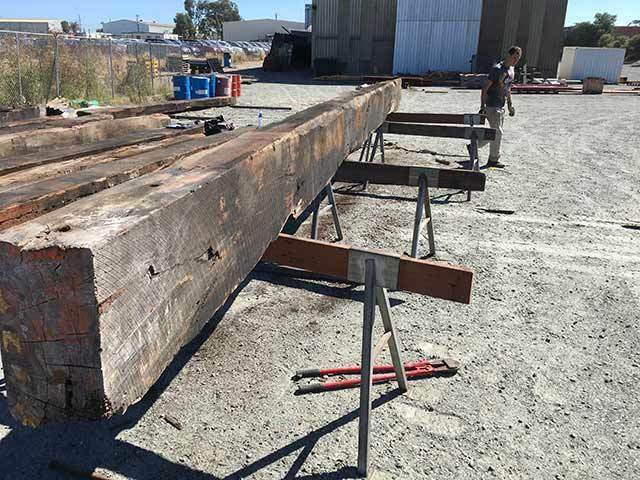 We have a wide range of timber posts and beams available in our Fremantle warehouse, which we cut to order to suit your project requirements. Your selected purchased hardwood timber posts and beams can be custom milled or cut to specific sizes, with either a natural edge or clean smooth edges. We can also work with you to have your purchased timber exported to a destination of your choice. All of our timber posts and beams are sustainably sourced from wind blown trees, land clearings and notable local landmarks, making our timber the perfect choice for your next sustainable timber project. Jarrah is a popular and remarkably fire resistant and robust West Australian hardwood. Renowned for it's rich red colours that deepen over time, Jarrah is popular for interior design, but is also useful for a range of outdoor applications. 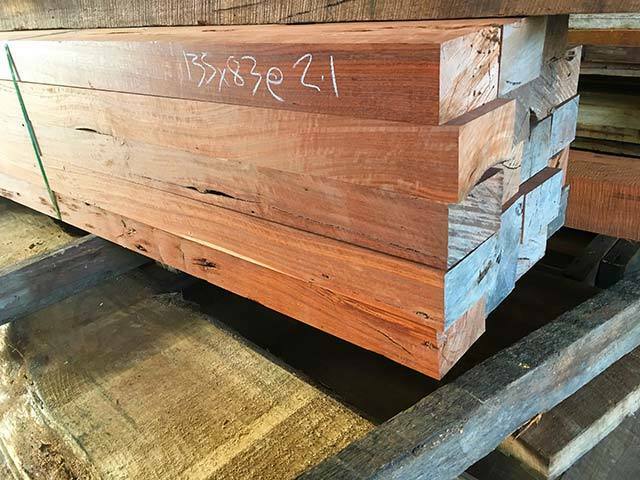 We have a range of Jarrah sleepers available, which we can cut into custom milled decking for commercial and domestic applications. 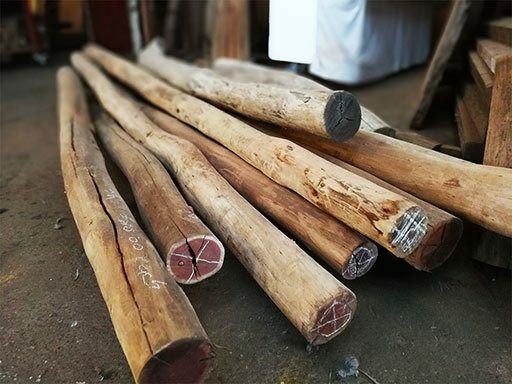 Just arrived in our Fremantle warehouse is a large selection of natural Jarrah bush poles. Available in various sizes and lengths, this timber is perfect for a range of landscaping applications this summer. Cut to order. 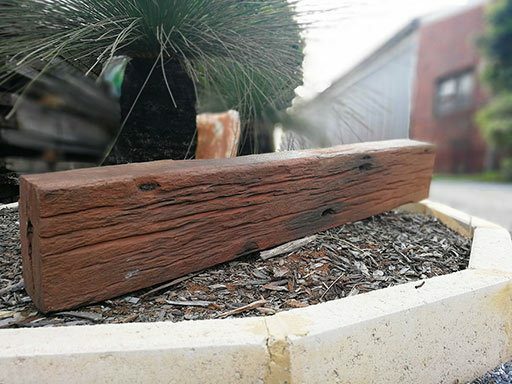 These giant beams were salvaged from an old Jarrah bridge at the Claremont Showgrounds, Ashton Avenue. 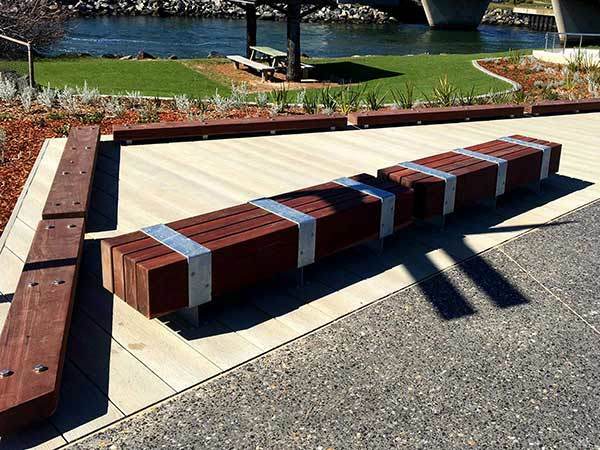 This ancient timber was sourced from a bridge in Northam WA, which has been rebuilt a number of times since it was first constructed by English convicts. 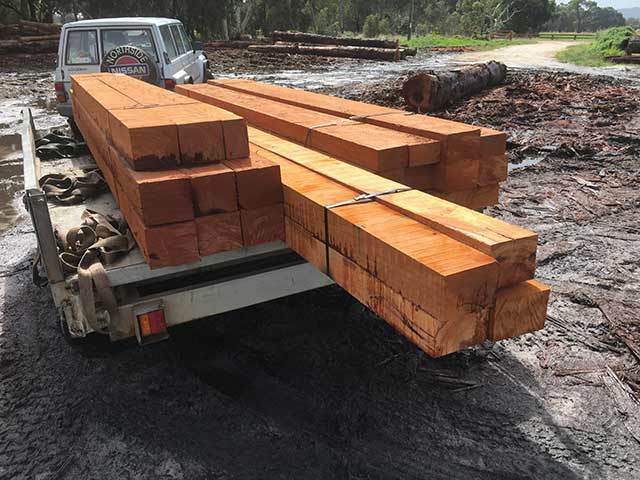 As a class A structural timber, this Wandoo is ideal for outdoor landscaping projects. Dimentions: 6.0m x 220 x 120 (up to 6m long). Cut to order from a residential land clearing, Maritime Pine finishes beautifully, with highlights of blue and green against the yellow of the pine. This incredibly tough timber is ideal for a wide variety of landscaping projects. Available in various sizes, we can cut to order to suit your project requirements. Please contact Terry to discuss our complete range of posts and beams available. Recycled Timber is readily available at our Fremantle Warehouse in Perth, in all shapes, sizes and forms - from Hardwood Slabs, Timber Posts Perth, Beams, Bush Poles, Gluts, Wharf Timber, Railway Sleepers, Stair Treads, Recycled Flooring to Re-milled Decking and more!